It’s remarkable because it turns over a leaf in an area of study that’s been combed over so many times you’d need to defibrillate its overly-researched corpse to give it life again. (I’m talking about the issue of how dietary fat affects human health). The study was conducted by Dr. Ulf Risérus, and it examined whether or not the presence of a compound called MFGM (Milk Fat Globule Membrane) affects the way fat in dairy products raises cholesterol levels. Experimental evidence suggests that saturated fat raises both LDL and total cholesterol, which forms the basis for many of the dietary recommendations around its consumption. However, according to the research of Dr. Risérus and others this effect might depend on the presence of MFGM inside the milk. I reached out to him to answer my questions about his research and he was kind enough to provide me with answers about its results, future directions for this line of study, and what this means (or does not mean) for how we ought to think about the role of saturated fat from dairy products. In laypersons terms how would you describe the purpose of your experiment? The purpose was to test if a specific component present in dairy fat (a specific membrane surrounding the fat, milk fat globule membrane, MFGM), plays a role in modulating blood lipids and other cardiovascular risk factors in humans. 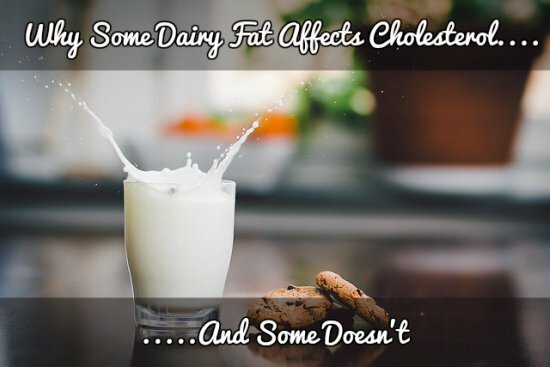 It is well known that most dairy foods raise blood LDL cholesterol (“bad cholesterol”, an established risk factor for heart disease), due to its high content of saturated fats. However it has been previous observations that suggest that not all dairy foods raise blood cholesterol. The reasons for such differences among different dairy foods are unknown but one possible explanation could be different content of the MFGM in dairy foods. We aimed to test this hypothesis in a carefully controlled clinical trial conducted in overweight men and women. We hypothesized that butter, that is low in MFGM, causes a more adverse effect on blood cholesterol than dairy foods high in MFGM, e.g. cream. Only butter markedly raised the “bad” cholesterol in the blood, whereas cream did not. These results were thus in accordance with our hypothesis that the considerably higher amount and intact MFGM in cream could have caused this differential effect when compared with the butter diet which is low in intact MFGM. MFGM is probably a new term for many people. What is it and how does it work? Milk fat is secreted from mammary cells as fat globules, these MFGMs are mainly composed of a globule of fat (triglycerides) surrounded by a membrane. This membrane helps to stabilize the fat globules in the fluid milk. In your paper you noted that the MFGM group had a different gene expression than the control group. How so? This is yet unclear but it might be that the presence of the MFGM in the dairy food may directly or indirectly alter gene expression, i.e. “switch on” or “switch off” specific gene involved in cholesterol metabolism and regulating the blood levels of cholesterol. How is MFGM found in the food supply? In several high-fat dairy products, but is much lower in butter. What determines its presence or absence? It is mainly found in dairy foods such as cream, whole milk, and cheese, whereas it is low in butter. The processing of making the dairy product determines the MFGM content, including churning and homogenization, but also temperature. However, apart from the MFGM content, it may also play a role whether the MFGM is intact or broken down into pieces. In our study, we wanted to keep the MFGM as intact as possible, i.e. the cream was not whipped or heated. One might think adding MFGM in certain products would be able to counteract the pernicious effects of saturated fat in the diet but you stated in your paper that this intervention has had mixed results. Can you elaborate? Yes this is indeed an interesting possibility since cream did not raise LDL cholesterol despite similar content of saturated fat as found in butter. However, some more research is needed to further explore this, since it cannot yet be completely ruled out that slight difference in saturated fat intake between the butter and cream diet may have explained the differential response in blood lipids. How should this body of research shape people’s perceptions about the benefits or drawbacks of dairy fat in the human diet? The current guideline is sound and based on current evidence, i.e. to mainly use low-fat dairy (e.g. yoghurt), and especially replace butter with vegetable oil or plant based spreads. Cheese may be a useful and potentially healthy food according to recent research, but this need some further study. In people with elevated blood cholesterol the use of high-fat dairy should be consumed with moderation and instead the use vegetable oils, nuts and fats should be increased. However, cream and cheese thus seems to be better choices than butter. What questions still need to be answered in this area? There are several interesting questions to be answered: Does the effect of MFGM depend on how intact it is or is it merely the amount of MFGM that plays a role? What is the influential effect on blood lipids after a meal? (in the current study we only measured blood lipids and other cardiovascular risk factors in the fasting state). Does it matter if the cream is heated or whipped? (in the current study is was consumed unheated and without any whipping). What is the effect of MFGM on fat and sugar metabolism in the long-term? Thank you Jonathan, I am very much thankful to you that you shared this research about dairy products related to cholesterol. This will help me in my research. Cool, thanks for the extra info. I read a summary of this research recently. Do you know which cheeses have high levels of intact MFGM? A quick google didn’t show much, but it seems gouda and cheddar have more, cream cheese will have less. Great article! You caught this health nerd by surprise because I’ve never heard of this before. Maybe this is why the French don’t get fat? I’ve been told that dairy products are bad if you are trying to lose weight, so I’ve been dropping it for my diet. I switched into drinking and eating non-dairy food products like almond milk and cashew cheese.